Dogs on campus usually attract dozens of students, nearly all of whom have their iPhones ready to capture brief interactions with the stress-relieving pets. 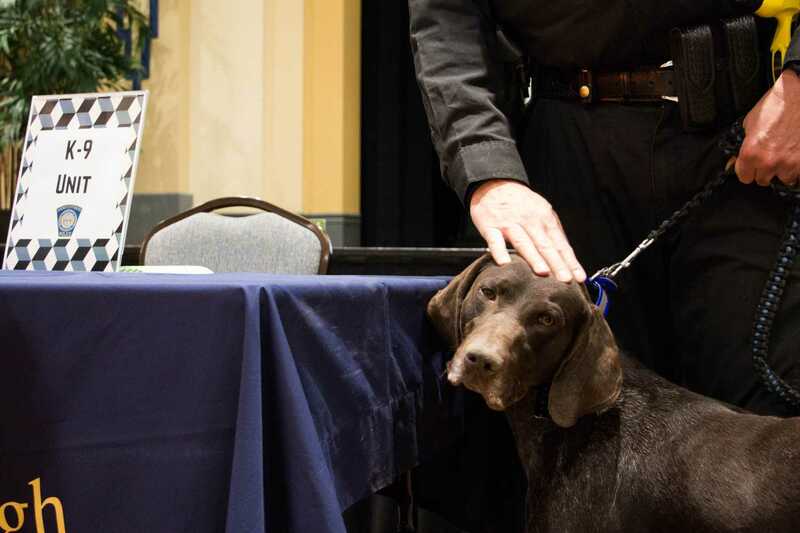 But Sam, a 3-year-old German shorthaired pointer trained to detect explosives, didn’t draw that kind of attention at the annual Safety Fair Tuesday afternoon in the William Pitt Union ballroom. Sam obediently sat by his handler, Pitt police Sgt. Dave Nanz, while students and faculty members browsed more than a dozen booths dedicated to a broad range of other safety- and security-related topics. Priscilla Morales, assistant to the assistant vice chancellor, greeted each student as they arrived and asked them to check in before explaining the event she put together with the help of the Student Government Board. The Safety Fair was intended to cover a broad range of safety-related topics, including crime, fire, sexual assault, alcohol abuse and bike safety. “We just want to give more awareness to the campus community,” she said. Representatives from more than a dozen departments dedicated to public safety and community wellness stood around the perimeter of the ballroom. Morales said the free pizza on one side of the room was only fair to provide to students. For Pitt students, some of that money goes toward mandatory fees, including the $180 security, safety and transportation fee. Students who attended the safety fair got a glimpse of how some of that specific fee is spent. Members of the Pitt police investigative unit, including Detective Michelle McDaniel and Detective Patrick Laughlin, stood at the table next to Nanz. Laughlin stood in front of an open briefcase — which included a DNA collection kit and various microscopes. McDaniel displayed Pitt police’s fingerprint technique with a blank sheet of paper and a small glass dish of magnetic dust. After pressing a volunteer’s hand to the paper, she brushed the magnetic dust over it, revealing the handprint left behind. These methods are often used in burglary cases and can be crucial in closing a case — which can be difficult. “My favorite part [about being on the Investigations Unit] is if you can solve the entire case,” McDaniel said. McDaniel said students can increase the likelihood of their burglary case being solved by keeping the serial numbers of their electronic devices. Doing so increases the likelihood the Investigative Unit can track any stolen goods sold to pawn shops. “[Pawn shops] have to keep receipts, and they have to take IDs,” she said. Other Pitt police special units at the event included the Special Emergency Response Team, comprised of 10-15 officers including four medics. The team is trained to respond to any life-threatening situation including active shooter situations and bomb threats. Sgt. Charles Welsh, one of the tactical medics for the SERT team, hosted a display about opioid abuse and emergency first aid. He said Pitt police was one of the first departments in Allegheny County to equip its officers with naloxone, a widely used antidote to opioid overdose. The program began in 2016 when Dr. Ronald Roth, chief of Pitt’s EMS division and professor of emergency medicine, approached Welsh. Roth pushed the department to keep naloxone in every police car. Welsh said, though, Pitt police have administered the antidote only “five or six times” since the program’s introduction. “It’s mostly the transient community,” Welsh said, making sure to note Pitt police have never administered naloxone to any Pitt student. Raina Bradley, a senior administrative criminal justice major and intern for Pitt’s Title IX office, didn’t have any battering rams or dogs to attract visitors to her booth. She had fliers on the table and a colorful wheel students could spin to spark conversations about relationship violence and sexual assault. For many, she said, those conversations struck close to home, like for one student who spun the wheel and landed on a specific type of dating violence her friend experiences. Although the prospect of going to the police or Title IX may seem daunting, she and other representatives at the fair want students to realize people like them are trying to help.